When it comes to expensive outfits or attire for special occasions, it is important that your garments fit you correctly. Give us a call today to schedule a fitting with our specialist. Need your clothing altered in a flash? No worries! 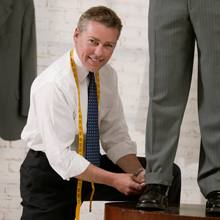 You can depend on our trained and experienced alteration specialist to provide you with fast and accurate results. Come in for award-winning service. We have been named Best Dry Cleaner of Manchester by the Manchester Award Program, so you can be sure that you’ll get excellent care.